To me, the American black bear is the most interesting yet secretive big American animal. There are more black bears in the world than all other bears combined. They have the largest distribution of any of our big mammals, and occur in 92 of Virginia's 98 counties/county-cities. They eat most anything, can run 35 mph, are fantastic swimmers and tree climbers, and amazingly strong! They are very intelligent, have remarkable long-term memories and navigational skills, and can tolerate any weather. No wonder these bears figure prominently in most Native American tribes’ mythologies, often representing medicinal or magical powers, a protector or enforcer spirit, wisdom, motherhood, confidence, and/or strength. Based on the number of scent receptors, bears have the best sense of smell of any land mammal, and seven times that of a bloodhound. They also have a Jacobson's organ in the roof of their mouths like snakes that further enhance their sense of “tasting” the scent particles in the air to locate mates and cubs, avoid danger, and find food up to many miles away. Bears can see fairly well — at least as well as humans — with color and binocular vision for good depth perception, and nearsightedness to seek close-up and colored foods. Cubs are born with blue eyes which change to brown in year one. Being omnivores they can adapt their diets to a variety of (mostly) plant and animal-based foods-- grasses, fruits, nuts, berries, insects, small animals, reptiles, amphibians, carrion, and an occasional fawn deer. From my direct observations, their favorite foods in Virginia are berries and acorns. Even though they are named black bears as seen in Virginia, colors in western North America range from blonde, cinnamon, and medium, dark and red-browns, to silver-blue (aka Glacier or blue) and cream (aka Spirit or Kermode bears). Most cubs are born with whitish throat blazes that usually fade away. Black bears live up to 30 years in the wild, weigh 125 to over 600 pounds, and live solidary lives except for summer mating or when rearing cubs (typically two). Rarely do they have more. In August of this year, I had the opportunity to observe a mom black bear with her cubs near Luray, VA. The smallest imitated mom to a “T”, two frolicked non-stop, and the largest stayed its distance. Black bears are gentle, crepuscular (active at dawn and dusk), and secretive, always scooting off at the first smell or sight of change. I found no record of anyone being killed by a mother black bear defending her cubs, and only 61 people killed by these bears across North America since 1900. Black bears gain over 100 pounds, mostly on acorns in the fall, in order to increase their fat to muscle ration for winter hibernation. You’ve heard about living off your fat, well, this is a prime example of utilizing their fat to create the energy needed for survival during the hibernation period. A female bear can eat 15,000 calories a day; a human woman eats one-tenth that, explaining why black bears can survive without food for up to seven months while hibernating (and birthing every other year). These bears will not eat, drink, urinate or defecate (unlike small mammals) while their heartbeat declines from 40 to 8 beats per minute when hibernating. 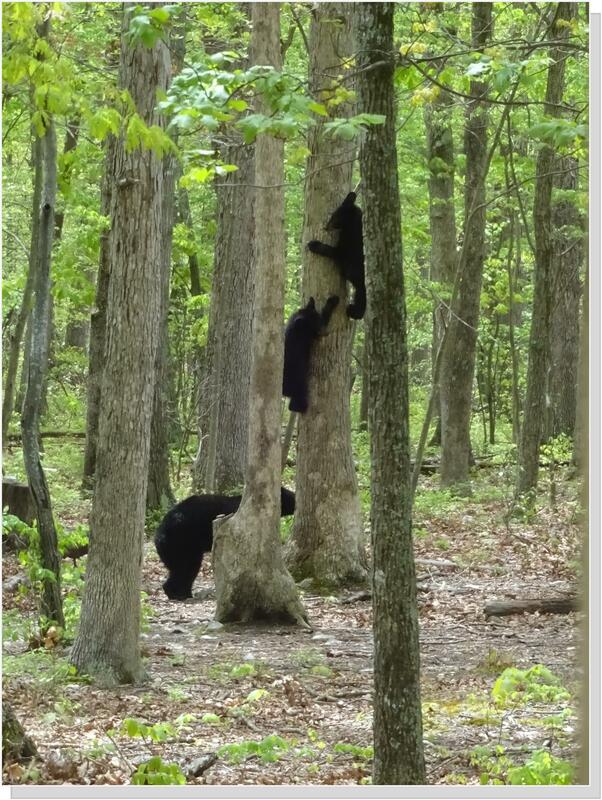 Talk about deep sleep and no worries for these cautious kindred spirits of the Virginia forest. 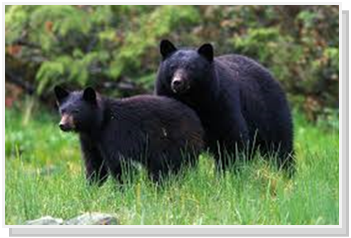 According to Animal Control Officers and the Fairfax County Wildlife Management Specialist, it is not unusual to see black bears at this time of year and residents should not panic or feel alarmed when they see one. 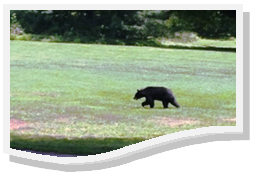 A bear was spotted in the 1300 block of Trap Road, Vienna area at around 1 p.m. on Monday, June 22, and a resident took photos to share with our animal control officers. The bear posed no problems or issues and it is likely that this bear has already moved through and not staying in the area. Bears typically avoid humans, but in their search for food it is not uncommon to see one. Most often, bears will keep moving through an area once they fail in their attempts to find food. Unless the animal is sick or injured, or poses a threat to public safety, animal control officers do not take actions to attempt to remove bears from a neighborhood. Black bears have a natural fear of humans, and in most cases, would rather flee than encounter people. * The best way to encourage the bear not to return is to remove the food source. * Do not store household trash, or anything that smells like food, in vehicles, on porches or decks. * Keep your full or empty trash containers secured in a garage, shed or basement. * Take your garbage to the dump frequently. * If you have a trash collection service, put your trash out the morning of the pickup, not the night before. * Take down your birdfeeder for 3-4 weeks after the bear visits. * Consider installing electric fencing, an inexpensive and extremely efficient proven deterrent to bears, around dumpsters, gardens, beehives, or other potential food sources. * If addressed quickly, this situation can be resolved almost immediately after you remove the food source. Sometimes, the bear may return searching for food, but after a few failed attempts to find it, will leave your property. For more information, see: http://www.dgif.virginia.gov/news/release.asp?id=421.